View cart “Fridge Filter FLUORIDE CHLORINE/CHLORAMINES PLUS” has been added to your cart. EXTRA protection against chemical and organic contaminants including pharmaceuticals. Kitchen Fluoride, Chlorine, Extra Protection Water Filter Plus. This filters all that a 2-canister Fluoride Plus Filter does, and adds a second wide-spectrum filter cartridge for EXTRA protection. The two wide-spectrum filter cartridges work against chemical and organic contaminants. These include pharmaceuticals, drugs, heavy metals, hormones, etc. The added wide-spectrum cartridge, the KR101A, does all the first one does, but also filters out cysts and microfibers. Click the microfiber blog link to learn more. Having three canisters means that you have flexibility going forward to use other cartridges, for if your situation changes. If you want the best under sink filter for fluoridated water, and you don’t have chloramine, this is it. The Kitchen Fluoride, Chlorine, Extra Protection Water Filter is the same as the 2-canister FLUORIDE PLUS filter (click here to see test results of the 2-canister) plus an extra canister doubling up on the amount of kdf and carbon. This provides a higher level of protection from pharmaceuticals, chemical, organic contaminants, and heavy metals. Friends, don’t wait until you are frightened by some particular contaminant proven to be in your drinking water. We know for a fact there are hundreds of them in our water supplies, many unregulated. Get quality kitchen filters that work on all the categories of contaminants. This is a multi-stage filter system. In addition to sediment filtration, there are 5 stages. See the other tabs, including the REFILLS tab for info and links. Please have this filter installed by a plumber. It is a quick and easy job for a professional, taking about a half hour. WHY? Click on: GET A PLUMBER!. The first canister has 2 sediment filters and two other filter mediums that will filter free chlorine, chlorination by-products, chromium, mtbe, trihalomethane, organic-based drugs and hormones. chemical contaminants like chemical-based pharmaceuticals, and heavy metals. 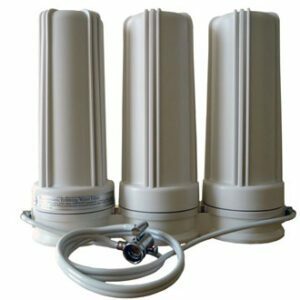 This filter filters chlorine, chlorination by-products like trihalomethanes, perchlorate, heavy metals like lead, sediment, algae, molds, hormones, pesticides, pharmaceuticals, scale, bad taste, odors and hundreds of contaminants. Bacteria cannot grow in the carbon because of copper-zinc. The second canister has a sediment filter and filters fluoride. Choose Activated Alumina or Calcium-based Carbon (bone char.) Both work very well. We do not recommend one fluoride-filtering media over the other. We offer two because they are available and both work very well, so we give our customers the choice. Calcium-based carbon is also known as bone char. Vegans and vegetarians may prefer to not use bone char. The third canister does everything that the first one does, and ADDS filtration of cysts and microfibers. All together there are 2 POUNDS (OVER 900 grams) of top-grade coconut carbon for extra protection from MTBE and other organic contaminants, and a balancing amount of kdf – 2 1/2 pounds all together – to remove chemical-based contaminants like pharmaceuticals, and heavy metals. The kdf in our filters uses a special patent-processed FOAM ADVANTAGE kdf that increases effectiveness and length of use – and does not clog – supporting a strong water flow for the life of the filter. This also means that more kdf filtration happens in a smaller part of the canisters – leaving more room for carbon, thereby increasing carbon filtration too. For more information, see The Foam Advantage. Take out the bad and leave the healthy trace elements your body needs. This filter is right for you if you want extra insurance from high levels of pharmaceuticals, illegal drugs, hormones, mtbe and other contaminants that you know about – or that might surge in your supply. INCLUDES A FAUCET that runs through the opening in your sink. A standard faucet is included. We recommend the upgrade to a better and more attractive faucet. For more information about drugs in the water AND A VIDEO, click on Drugs in the Water and Pharmaceutical Water Filters. 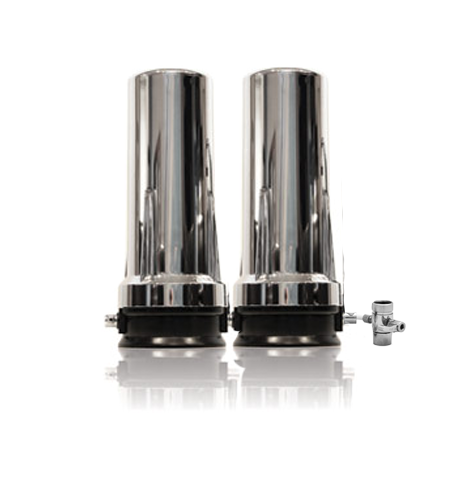 The housings can handle 33% higher pressure than industry-standard white housings. The free wrench we include is slightly larger to adapt to the more robust canisters. The improved housing was introduced after we made this video. The housings of the undercounter filters are now as shown in the still photo. To see a sample list of many of the contaminants filtered by this water filter, see What Is Filtered? Combine in one annual order to save on shipping. Click this link to see a description and a short video on changing cartridges. I had been suffering with untreated and under-treated hypothyroidism for many years, and even after starting to finally get some thyroid hormone replacement help, I still didn’t feel as well as I knew I should. My husband and I had been reading for years on natural health remedies and searching for what causes the thyroid problems that seem to be so prevalent today for so many people. In our research we had come across several different references to how fluoride in the water supply could affect thyroid function. But fluoride filters were expensive (the cheap ones at your local hardware store don’t remove fluoride), and we thought to ourselves surely there are other more relevant effects on my thyroid than just the water. After all, if fluoride is that bad, how can they add it to the water supply like they do? We finally bought a very expensive filter on the recommendation of our natural health practitioner, and after a few years using it, I still felt pretty awful. Then the topic of fluoride came up again and I started looking at our very expensive filter (think $700 filter! ), and found there was no mention on their website about fluoride! So then we started looking for a new filter that did remove fluoride, and thankfully we found Friends of Water online. We ordered the 3 canister under-counter package and installed it right away. I didn’t really notice any difference immediately, but about three months after it was installed we went on a family trip to go zip-lining. It turns out it wasn’t just zip-lining but a very intense obstacle course that you had to pass through first. I knew from my thyroid history that anytime I pushed myself that hard physically, I would be sick with flu-like symptoms within a couple days afterward. So we returned home, and I braced myself for the coming sick-time… but it never came! This “exercise causes sickness” had been repeated so many times over the past several years, you could literally set a watch to it, but now nothing! I had done intense exercise, and was not feeling any after effects at all! I’m not sure if I realized then that it was the chemical and fluoride-free water that made a difference, but I sure realized it several months later when I started to have some old symptoms again. Along with getting sick after exercise, I felt angry a lot, and that too had subsided over the past several months, so slowly that I had not noticed it either until it started to return. This was back when the recommendation was to change the fluoride filter once per year. It had been 8 months, and with returning symptoms, I asked my husband if he thought he water filter maybe stopped working. We went straight to the store and bought a large supply of spring water which I then drank exclusively for the next week – and all the anger and sickness quickly faded away. I immediately called Friends of Water and told them I thought the fluoride filter had stopped working earlier than a year, and they suggested that maybe I replace mine sooner since I seemed to be extra sensitive to fluoride. Since that time I have replaced the fluoride cartridge every 4-6 months and am doing great! Shortly after my call with Friends of Water they even went back and did more research and changed their recommendation to replace the fluoride filter every 6 months instead of every year – and it is a very wise thing to do! Having the fluoride filter plus the extra two cartridges to remove all the other chemical in our water has literally been a life-saver for me. As a bonus, after switching the filtered water, I lost 30 pounds without changing anything else. Just stopping the constant bombardment of all the chemicals going into my system had a huge impact. I am no longer sick all the time, I exercise daily, and I don’t feel angry anymore. And, as always, anytime I’ve had a question about a product or order, Friends of Water is always very helpful with immediate responses and lots of information. Thank you Friends of Water!! We’ve had this filter since 2013. We’ve been very happy with the taste and look of the water. Although we do not have any chronic medical issues we were hoping to treat, the peace of mind is great. I pack bottles of the water when we go out of town. I (mom) replace the filters myself. We did have the plumber do the initial install. We purchased this water filter in October 2015. My sister-in-law had purchased this same system and really liked it. At the time we had an Reverse Osmosis water system under our kitchen sink. An RO strips the water down so much, we had to manually add back in trace minerals and I just did not want to do that anymore. So when the RO needed serviced, we just switched the whole unit out. This filter has GREAT pressure, so much better than our RO. The water tastes great too. We did upgrade the faucet. Timothy was super helpful in figuring out what filter was needed based on our cities water. We have now just finished our first 6 months of use and needed to replace just the fluoride filter. My husband was able to do this in about 5 minutes. I will admit I was a little nervous as this is the first time we had touched/moved around the unit since the plumber installed. During the install the plumber did have to add quite a bit of plumbing tape where the water lines connect on each end of the unit. I just did not want it to start leaking and it was fine and did not. So use a reliable plumbing and definitely keep an eye on it once installed for the first few days, that it is not leaking anywhere under your sink. Love having fresh, clean water at anytime, no dragging bottled water from the store or adding back in trace minerals. Maintenance free other than the filter changes at 6 months (fluoride only) and all 3 at the year mark. So worth it!! I’ve been using the kitchen water filter system known as “3-Canister Pharmaceutical, FLUORIDE Chlorine Filter” (name changed to “Fluoride, Chlorine, Extra Protection”) for over three years. I thoroughly love it and have appreciated the friendly, helpful service and advice I have received from Friends of Water. Because of the filter, my drinking water tastes great and I have the peace of mind of knowing that I’m taking care of my health in the process. I will continue to do business with Friends of Water. My family and I have been using the water filter system for the past 3 months and oh, what a difference! We have a child who has special needs along with wanting the best for everyone in the family so having clean drinking water is a must. Other water filtration systems don’t compare to the one sold by Friends of Water. Most importantly, the customer service given by Timothy is much appreciated because it’s good to know that him and his wife stand 100% behind their product. This shows their passion and commitment to helping people in making sure we are drinking truly CLEAN water for our health. I highly recommend this product, and just about anything on this website to everyone I know. I’ve been impressed from the beginning by Tim’s personal, timely responses to any questions or issues, but most importantly by all the up-front research he has done to determine if he’s going to carry a product on his site. A true rarity these days! Even had the spigot replaced no questions asked, when 1.5 years later it started leaking & plumber said it needed replaced. As for the water quality itself, I feel this is the best kitchen filtration I have had yet. As long as you keep the filters swapped out on time it does great. Thanks friendsofwater for all your great service!